The history of the cowboy hat is not that old. Before the invention of the cowboy hat, which means before John B. Stetson came along, the cowpunchers of the plains wore castoffs of previous lives and vocations. Everything from formal top hats and derbies to leftover remnants of the civil War headgear, to tams and sailor hats, were worn by men moving westward. Today's cowboy hat has remained basically unchanged in construction and design since the first one was created in 1865. As the story goes, John B. Stetson and some companions went west to seek the benefits of a drier climate. During a hunting trip, Stetson amused his friends by showing them how he could make cloth out of fur without weaving. After creating his 'fur blanket,' Stetson fashioned an enormous hat with a huge brim as a joke, but the hat was noted to be big enough to protect a man from sun, rain, and all the rigors the outdoors could throw at him. 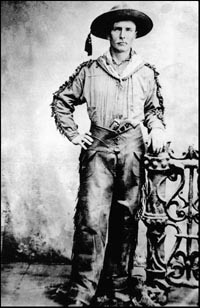 Stetson decided to wear the hat on his hunting trip, and it worked so well that he continued wearing it on his travels throughout the West. In 1865, he began to produce the first incarnation of his big hats in number, and before long, Stetson was considered the maker of this newfangled headwear, the cowboy hat. The original Stetson hat sold for five dollars. Shortly after the turn of the century, the cowboy hat, although still in its infancy, nevertheless infused its wearer with a singular link to the history of the wild and woolly West. Even after the wild aspect of the West was somewhat tamed, the cowboy hat never really lost its ability to lend that reckless and rugged aura to its wearer.